And that is one of the easier ones. Truth is, we are actually in the middle of a whirlwind of projects at the moment. but today, it is all about those lush beautiful overflowing and charming cottage style gardens. and making it feel a bit like it is in the English countryside. Did you know that I have made several runs to store to get plants just this week alone? We filled up the back of the truck and the inside of the truck and even doubled up on some areas. And did you know that I might have bought almost every last Foxglove I could find? And I did buy almost every last lavender too. I have a true gardening confession...when we first moved into our house sitting on this acreage of country property... I quite literally bought every pretty flower face at the market and put it out in the front planting beds. There was no method to my madness. No carefully designed garden planting plan. It was simply what talked to me as I went to pick up eggs and almond milk. If that was a purple hydrangea or a peach rose or a tall foxglove- that was what was in the cart. And I planted them all together in a big old flower bed area and something happened as they grew in. An English garden appeared. And over several months each of those plants grew bigger and bloomed more and crept into each other creating an abundant and charming planting area. And a love of cottage gardening was born. 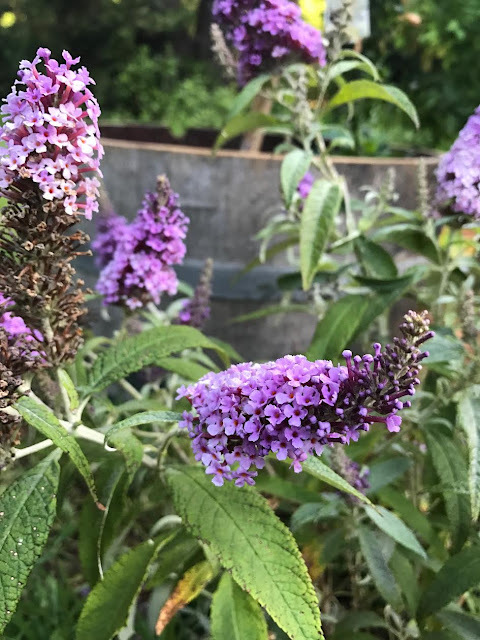 This time, I am being a bit less falling over heels for every plant and a bit more careful in selecting what I know grows well here, will not go so crazy that it makes ME crazy and will last and come back next year. But much of what I chose then - I am planting now. Smells great, has a beautiful sage color leaf and purple bloom. We have some that have grown to be several feet wide. I am a huge fan of deep, leafy oomph in the garden. Though I fall for pretty faces- I need to balance them with pretty greens. 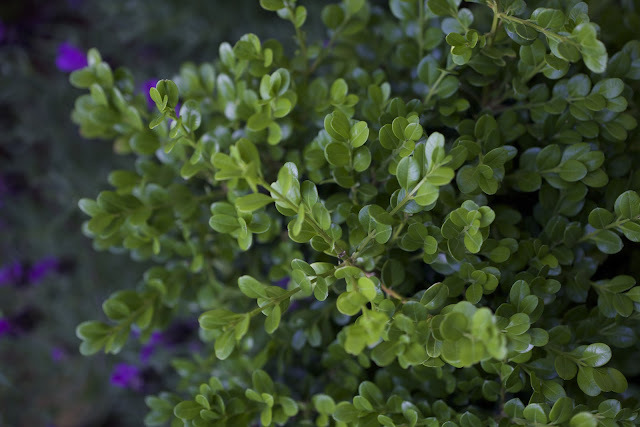 Boxwood is my go to choice for green plantings. and I will admit that I knew nothing about it. It is actually a poisonous plant- so if you have small children or pets who like to eat plants- you probably should choose something else. 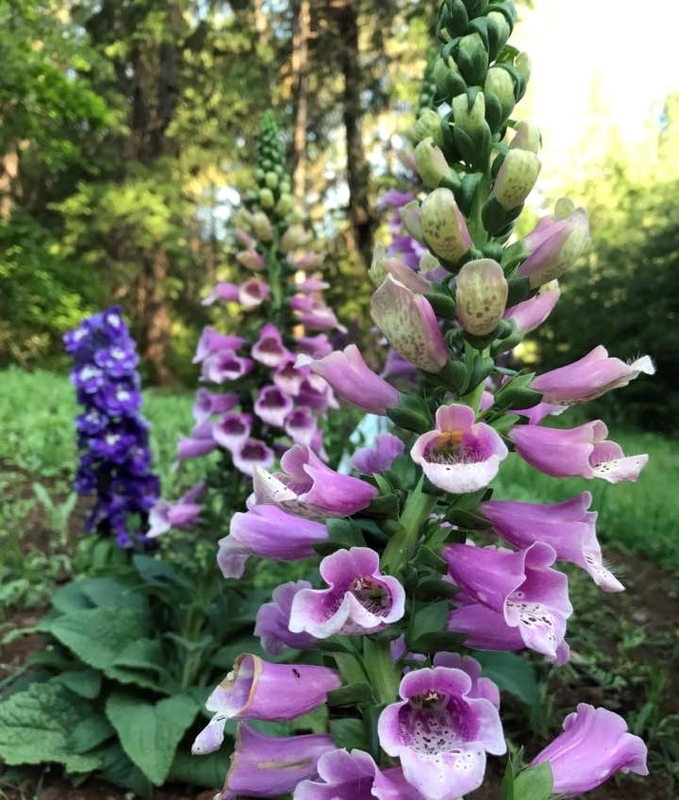 Foxglove is the plant they use to make Digoxin- which is a drug that is helpful if you need it- but not a good one if you don't. 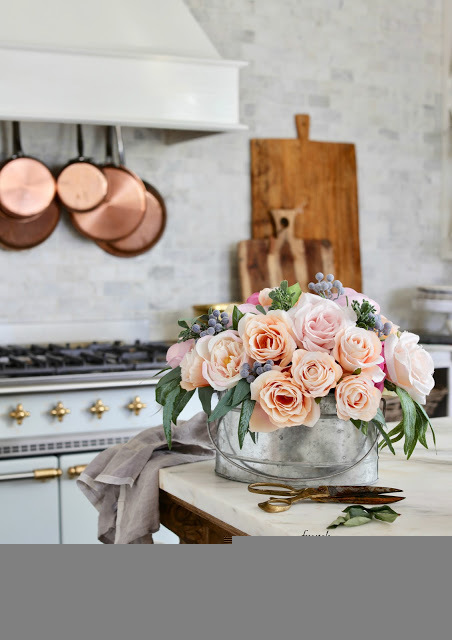 I love it it for that old cottage charm it brings- and those tall pretty blooms. Always a fan of roses in a garden... though not the best at keeping them pruned back- I will admit. This year, we went with white roses in tree and climber form. Such a pretty plant that adds loads of tall thin spikes of color. Delphinium, Larkspur, Wisteria, and more. Are you noticing a color theme? Mostly lush greens, shades of purple and whites. your garden area is big or small. And the crustier the better for adding that charm in my opinion. 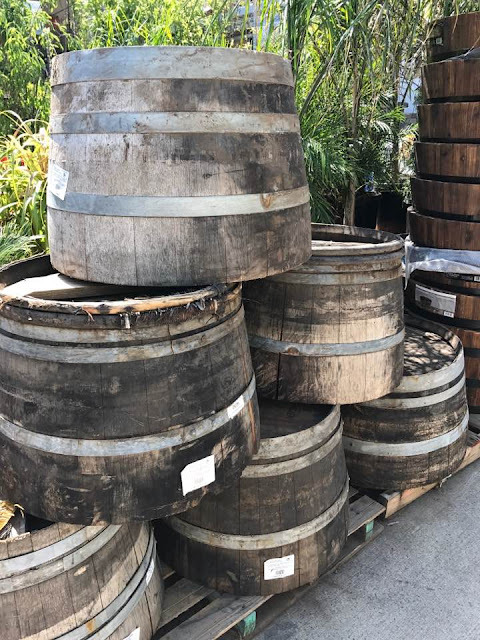 These are the reclaimed barrels- meaning- not those newly made ones that are clean and ready to go that you can see peeking out in the corner. I have a huge weakness for character and patina... and that pile of old barrels definitely has that. and ideas for using them into your garden design. And... the gardens are just getting started. These are just a few of my favorite blooms right now. and would love any suggestions of your favorites as well. what are your favorite plants to incorporate into them? Your garden must smell so lovely. I love the idea of adding the barrels to add a little charm. Oh that sounds pretty- I will check into it- thank you! 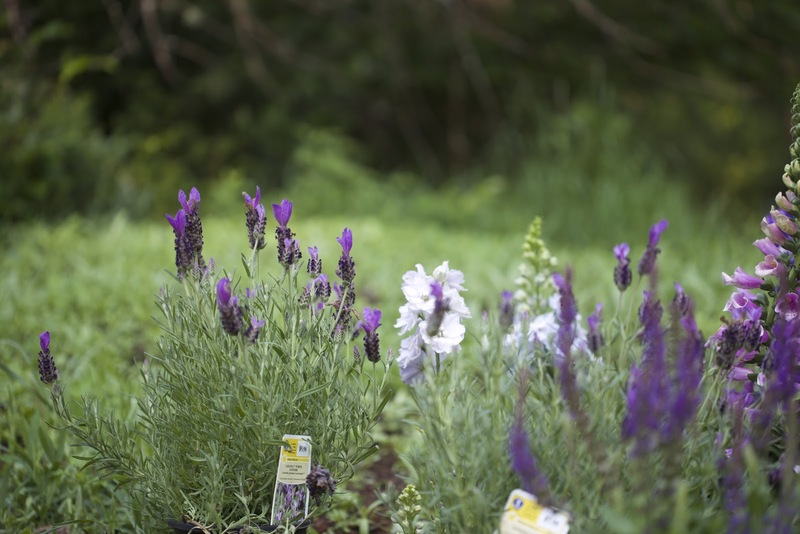 Your gardens are going to look lovely! I miss my last one at the Big House especially. Had to leave it behind two years ago when we had to sell ~ when Hubby was out of work the first year. Happily, recreating a version of an English garden is never too far away. I think you should plant some Penstemon! 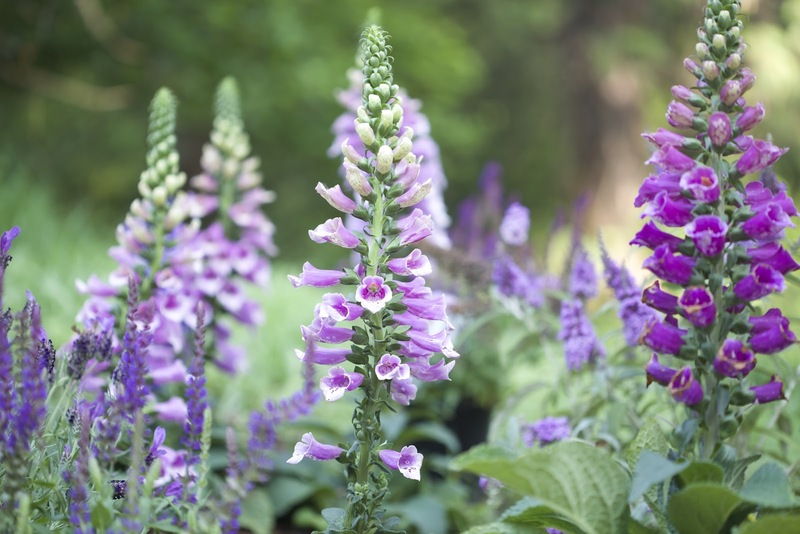 They are similar in flower form to Foxglove, but sturdier and very prolific. Many colors and a bit of variety in form. Literally I just cut them back and they come back with more blooms year after year. The hummers love them too! I honestly haven't done anything to get them to grow and re-seed- they tend to just do it- so I am not sure... maybe something to do with the soil? Maybe try and amend it before planting and see if that helps? Thank you much. I will keep trying as i love them. I noticed your question about foxgloves, so I thought I would mention that I grow foxgloves each year in my garden. I collect the seed when it dries and pop it into a paper bag. During September I buy soil specially made for seeds. I place the soil into garden pots, then sprinkle the seed over the soil. Finally I add a little more soil to cover the seeds. I water the soil and leave the pot or pots in a sheltered position, then during springtime you will see the seeds start to grow. when they are large enough, place the growing plant into individual pots and allow them to grow. When the roots have filled the pot, plant them into the garden. You will not see foxglove flowers the first year, but the second year, you will see tall spires beginning to form and you will be rewarded with beautiful flowers. Collecting seeds is also a very economical way to grow many foxgloves. I am currently planting seeds as I have moved into a new house and the garden needs a lot of work. I hope you find this information useful. Just to say I do live in England, and this system always works for me. I have purple Iris with Lady's Mantle in front... Lots of columbine, clematis, Canterbury Bells, threw out some cosmo seeds and hoping for something! All sounds so pretty! I haven't had great luck with clematis but might have to try again. Thanks for stopping by! Your garden sounds awesome, what about stock flowers and sweet peas , they will add such a beautiful fragence to your garde. I so love the barrels. Love stock and we actually have sweet peas that grow naturally on our property that are so great- love them too. Very pretty. I am looking forward to your pictures. We just moved into our house in October of last year. We have no landscaping so I have a blank canvas. My mom is coming on Friday to look at the front of the house to help me pick some flowers. I added quite a few to the list from your post. I have found so many flowers that I want to add but will have to add slowly. Have you ever planted from seed? I would like to try this in the back of the house to make a cutting flower garden. It's a whirlwind going through my mind, so many options. Thanks for the ideas. I have planted just a couple things from seed- I mostly throw seed out to mingle with the plants and fill in. You can also try 6 packs or 4" plants for less and I have found that sometimes those 4" plants are as big or even bigger than some of the gallon size. 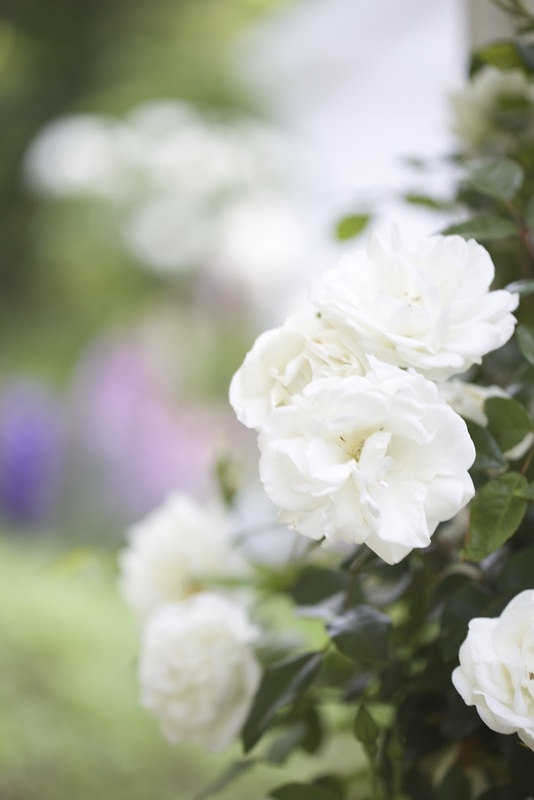 Your garden is lovely and I especially love your white rose. My mom always loved white in the garden. As always, a beautiful post. I love pink roses and lavender all bordered by a boxwood hedge. A little more structured but I love the look. Magnolia, cherry, oak and dogwood trees, snowball and sweet pea bushes, lilac, iris, white geraniums, tulips and daffodil. These are not plants, but our next cottage garden addition will be a white picket fence and a brick walkway. My favorite salvia is Victoria Blue. It looks very much like lavender and blooms all summer without having to trim old growth. It also comes in white. My favourites - peonies and almost every variety of hydrangea that there are - and there are many !! This sounds so pretty... I can't wait to read your garden posts! Star jasmine is lovely over fences for a cottage garden look and grows beautifully here is CA. It is in bloom right now and has a subtle sweet scent (unlink pink jasmine which is heavily perfumed). Looking forward to seeing your flower choices! My very favorite plant to grow here (NE) is dictamnus (also called gas plant). There are both pink and and white varieties. Another favorite is baptisia. There has been a lot of new breeding with this plant, so there are many gorgeous varieties available. Both are long-lived, slow-growing eventually quite substantial plants. I envy your foxglove and lavender, which both do poorly here. I do love salvias and boxwood, also. Happy gardening! 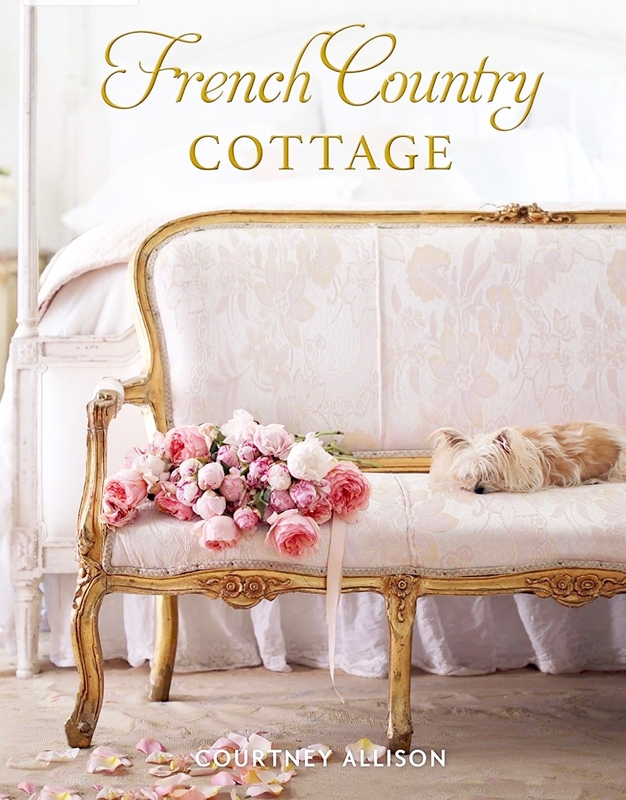 Courtney, I've been following French Country Cottage for years. 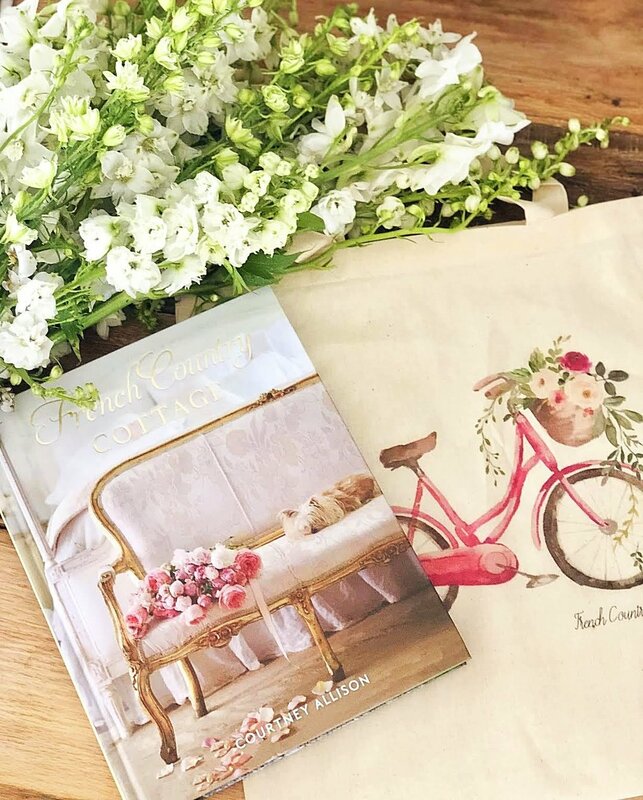 I love your style, French and Shabby Chic. As you do, I love Lavender, and years ago planted mine from seed grown indoors in February and which took a very long time to germinate and then grow enough to be planted outside(buying plants is easier), yet my lavender, here in Connecticut, situated against a couple of jetting rock boulders against our house, a micro-climate it seems, and planted in a mix of loam, a little sand, and pea gravel on top have survived from when I planted them, 23 years ago. I love all of your English country garden flower selections. The ones you haven't mentioned, I don't think, are Oriental Poppies (they do come in pink and an almost white as well as the orangey-red). I saw Poppies growing in the hot, dry climate of Mykonos, Greece, yet mine have reliably overwintered here in Connecticut, and bloom in early June, just after my light pink Peonies and blue German Iris, sometimes occasionally coinciding. Having said that, I've had some years of heartbreak when Mother Nature decides to "rain on my floral parade." The peonies flop (so I cut them for indoors, the Iris get so wet that their their blooms rot before they ever open, and/or the silky Poppies bloom, then get cut down by a heavy rain. That's when I'm thankful for my my Lady's Mantle (yellow flower spikes later) upon which, afterwards, the raindrops look like glistening round diamonds; my roses, blue Nepeta (catmint), in May, light blue Forget-Me-Nots and all the rest that aren't as delicate. Some years I get lucky and none of the above happens. That's when I get to not only smile, but feel my heart fill to overflowing at the exceptional beauty of my garden. When that synergy occurs, it seems worth some of the seasons of disappointment. Besides which, our Daffodils, and flowering trees, including a yellow Golden Chain tree, blossom reliably as do our Lilacs, so I count myself a happy gardener overall. I can't wait to see your indoor projects and your garden. 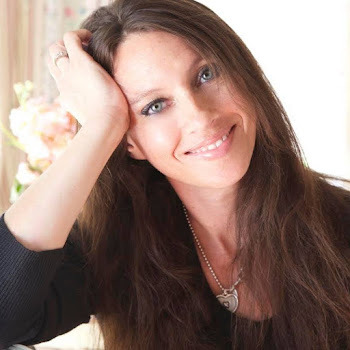 I'm very happy for your obvious success with your blog. 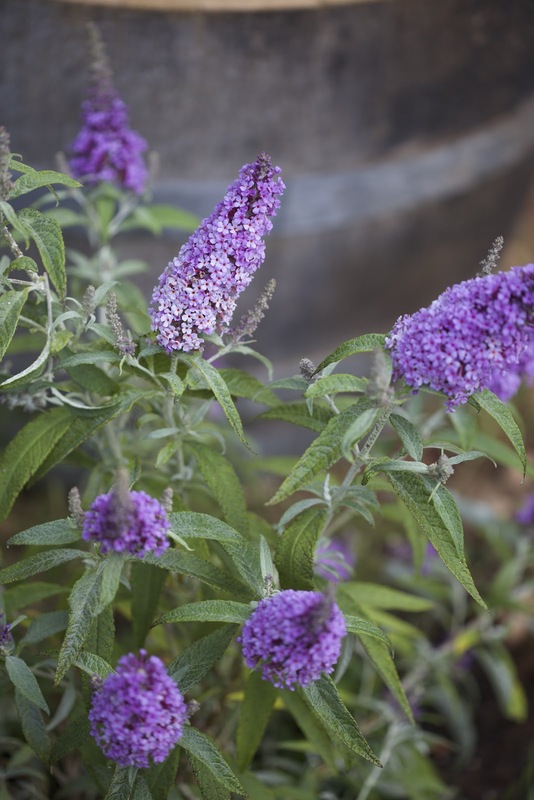 Butterfly Bush in violets attracts butterflies and perennial. Morning Glory is violet/blue and really opens in the mornings, facing East. Blue, lime green or white hydranga is a great, heirloom shrub. 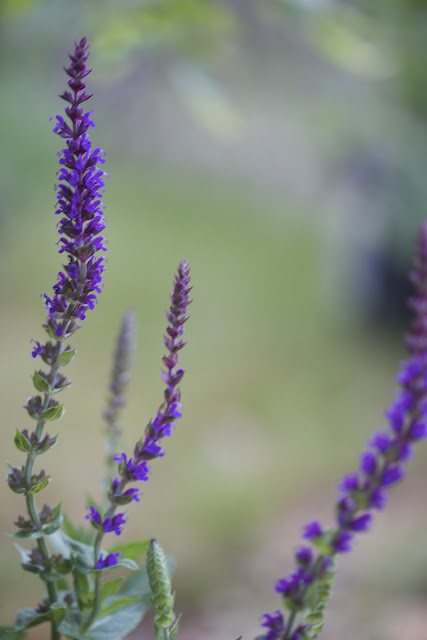 (green is newer variety) Salvia also comes in a dark blue/purple which comes back because it loves the shade. So many plants, so little time. Hydrangeas...they are so pretty when other plants are feeling those dog days of August. catmint is wonderful mixed in w/lavendar. super drought tolerant and re-blooms all year w/ a cut back. 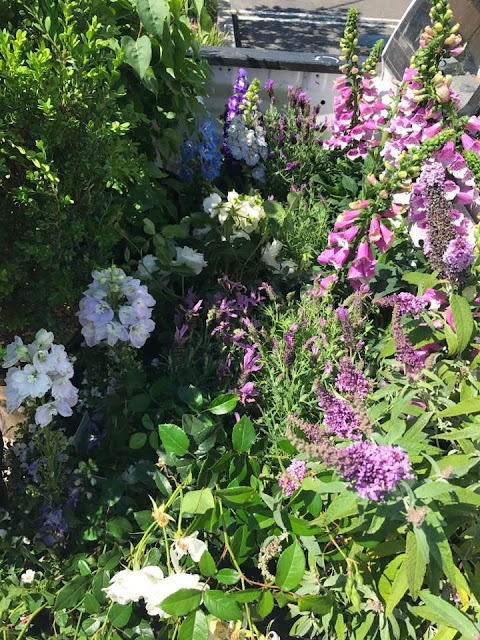 My garden must have, English roses (David Austin), bearded iris, hydrangeas, gladiola, lavender, buddleia and the companion milk weed, for the monarch butterflies, stock, petunias, geraniums in bright white (which look fabulous in terra cotta) and cafe au lait dahlias, and salvia. My favorite being black and blue. Old fashioned, lots of ruffles and fairly easy. Thanks for sharing your ideas and photos. 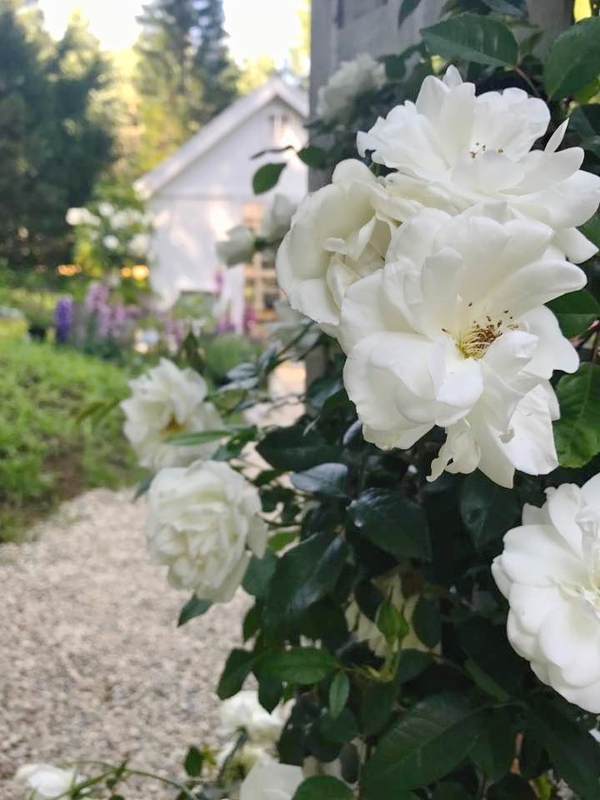 I grow lots of roses, lavender, nepera, wild geranium and hydrangeas and peonies among other plants and ground covers in my New Jersey garden. I recently added false indigo...lovely green with dark blue almost purple flowers. Gardening is a passion and I love every minute spent in the garden.